Over the past four years we as one church in The Woodlands area have partnered together to reach not only The Woodlands and Houston, but also work with the Jewish Agency in Israel. We sense God's hand strongly upon us in this partnership of One Mission with the Jewish Agency for Israel. God is creating a special bond between our community and Israel and we see the Lord opening some unique doors of opportunity. Will you join us? September 2013, nine church leaders from the area, eight senior pastors and one prayer leader, traveled to Israel to meet with leaders from the Jewish Agency. Since then we have established our formal partnerships in Israel. In April 2015, we opened a One Mission office in Jerusalem, Israel. In April 2015, we held our first Hope for Israel Gala assisting French and Ukrainian Jews to immigrate to Israel. In January 2016, Justin and Kynada Boland were sent by One Mission to be the representatives of One Mission in Jerusalem. Their primary role is connecting Christians and Jews through the administration of all activities for the One Mission office. In September 2016, we hosted our second Hope for Israel Gala raising support for Ibim Village Absorption Center. A home for new Jewish immigrants near Gaza. In 2017, we financially supported the return of over 130 Jews from countries around the world to their new home in Israel. For the past two years, we have supported the Jewish Agency for Israel by sending a full-time volunteer to facilitate the activities of the One Mission office and it's partnership with the Jewish Agency. We are blessed by all the Lord is doing, and we are excited to partner as one church from the area on this initiative. Ultimately, in all things, we are one church made-up of many congregations on One Mission. One Mission in partnership with the Jewish Agency helps Jews "make Aliyah" – return to the Holy Land as prophesied by Moses, Isaiah, Jeremiah, and Ezekiel, and establish themselves permanently as immigrants to Israel. We invite you to get involved and join us by becoming a Christian Friend of the Jewish Agency as together we continue to help write this historic story. PRAY FOR US as we continue the Biblical mandate to bring Jews home to Israel. VISIT ISRAEL so we can show you our programs and introduce you to new immigrants. WORK ON PROJECTS by providing hands-on labor at an Absorption Center to renovate and equip their apartments, computer rooms, playrooms, etc. PROVIDE FUNDING: On average, $4,000 provides for a Jewish person a one-way flight to Israel, and a home and community for the first five months. To rescue a Jewish person from an area in distress, bring them to Israel and give them a home and community for a year costs $5,500. One Mission hosted the Hope For Israel Gala in September, 2016 and brought together Christians from various backgrounds and denominations with two things in common; their love for God and their support of the ingathering of Jews to Israel. The evening was a beautiful presentation as we heard from senior leaders of the Jewish Agency Yehuda Sharf and Arielle Di-Porto. They shared their heart and passion to see all the Jews of the world return to Israel and build a thriving Jewish nation. That evening we presented the opportunity for Christians to become involved in tangible ways at the Ibim Absorption Center which resulted in a donation that helped sustain the operating budget of this unique home for new Jewish immigrants. 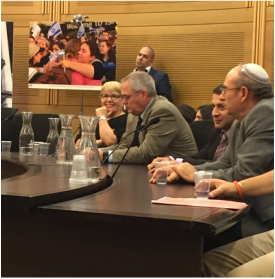 The Knesset Committee for Immigration, Absorption and Diaspora Affairs held a meeting on November 8, 2016 to mark the first "Aliyah Day" in honor of new immigrants to Israel (olim). The event was attended by new immigrants, immigration activists, Knesset Members, senior officials from the Jewish Agency, the Ministry of Aliyah and Immigration Absorption, and members of the Christian Friends of the Jewish Agency including Dvora Ganani, Hank & Marilyn Marion of One Mission and Rebecca Chavez of Deborah the Brave Ministries. "As you know, not all Christians have acted like friends to Israel and the Jewish people. And for that I am very sorry. God told Abraham that He would make him a large family and He would do it from many nations. I am not a Jew but I am one of those from many nations. In Isaiah 60 it says foreigners will rebuild your walls and kings will join you in your work. 4,360 years ago God saved the animals and humanity by putting them in an ark built by Noah. Today, the work of aliyah and absorption will preserve the Jews bringing them into the ark of Israel. And just as Boaz when he took Ruth, saved an inheritance, Aliyah will preserve the inheritance of God. In Isaiah 19 it says Israel is God's inheritance. In Joel 3 God says He will gather His inheritance from all over the world - those who have been scattered. So we work beside you - we work with you - we work with you in love. Not as Christians first, but as family according to the promise of God to Abraham. Let me say again, not all Christians have acted as friends but there are tens of millions who pray for you everyday - who love you. They do not know how to bless Israel, but we are telling them how. 'Todah Robah! (Thank You Much)'"
It was truly an honor to be part of this historic event as God continues to open unique doors of opportunity for the Christian Friends of the Jewish Agency. Thank you for your prayers. ﻿We invite you to actively engage our lives and congregations in a project, praying for the peace of Jerusalem and being a blessing to the people of Israel. To learn more about this joint mission with The Jewish Agency please watch the full-length documentary and download the photo storybook. If you are a pastor and want to know more about how your congregation can get involved with One Mission in Israel, please contact us for more information.